A modern and elegant Cubist design and lavish use of white make this sprawling German residence a stunner. Abundant use of clear glass allows sunlight to flood the interiors and open up the different rooms visually. A stunning pool, a hot tub, and patios and terraces ensure that the inhabitants get to indulge in countless outdoor pleasures. Composed of two storeys, the abode is both functional and aesthetic. The ground floor measures 1876 square feet and comprises of open plan living and dining areas, a study room and shower. The upper floor measures 1819 square feet and boasts of a spacious master bedroom with walk-in closet, two rooms for kids, and bathrooms. Contemporary energy-saving installations and an advanced ventilation system make this residence eco-friendly. Credit for everything goes to the general contractors at Okal Haus GMBH. 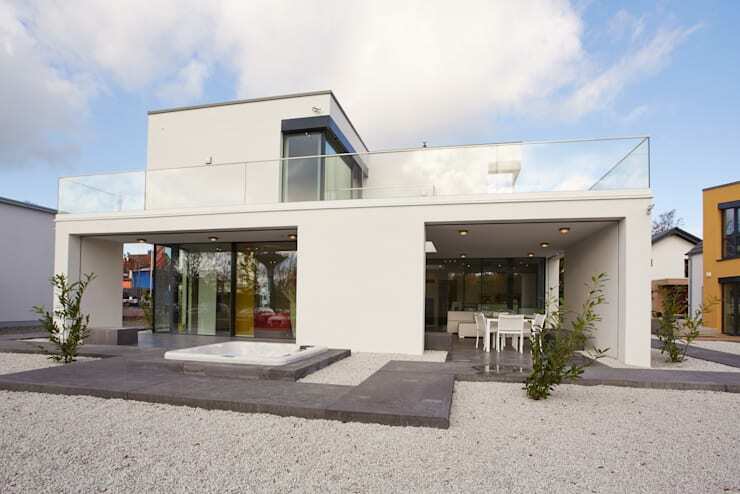 Simple and sleek lines, bright white walls and a breathtaking blue pool make the exterior of this house inspiring. 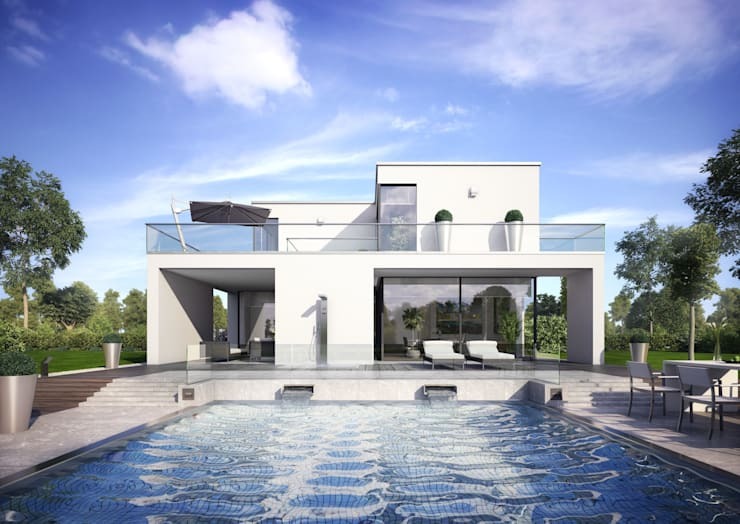 Stylish glass balustrades secure the deck on the ground floor and terrace on the upper floor, while large windows help the interiors to connect with the pool. Modern recliners invite you to sunbathe, laze around or chat under the blue sky. The wooden patio on another side of the house offers space for enjoying outdoor meals or soaking in the hot tub. Trendy furniture and large glass windows make this side of the structure inviting. Plants add colour to the pebbled surroundings of the patio. Neutral and soothing hues like white and grey lend a peaceful vibe to this open plan living and dining. 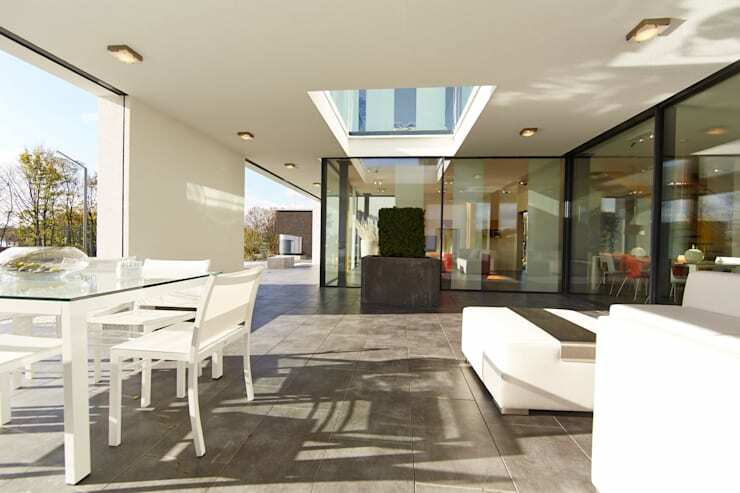 Luxurious internal glass walls make the home seem expansive and they allow light to travel unhindered. Massive glass windows overlook the pool, while the fashionable furniture makes dining, relaxing and entertaining pleasurable. This informal living space combines a bold red sofa with lime yellow cabinets above the TV and a stunning orange rug for a lively impression. 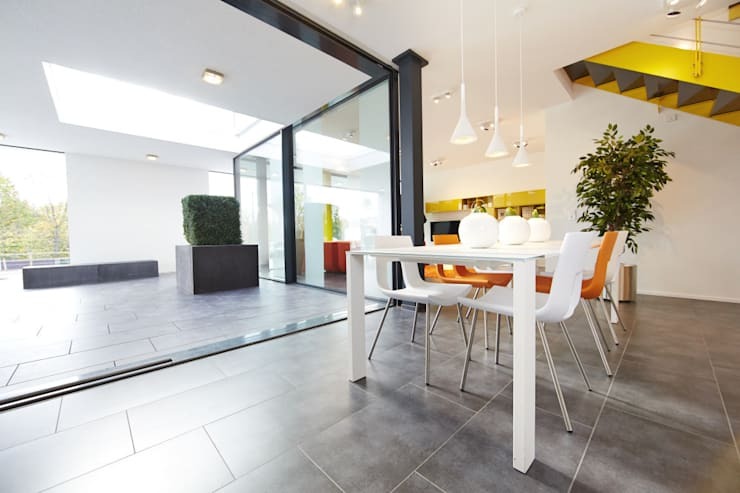 Large grey tiles on the floor make an elegant statement, while a tall potted green lends refreshment. A sleek white table surrounded by ultramodern white and orange chairs promises exciting mealtimes in this house. Glass walls connect this space with the outdoors and flood it with natural light. Soft shades of white and grey dominate this spacious and well-lit bedroom for a cosy and serene feel. A hint of colour appears on the bedding and the artwork behind the bed, while a potted green makes a fresh statement. The half-wall behind the bed smartly separates it from the walk-in closet.